Budgets have a tendency to be great in action, but difficult in theory. That’s because many of us treat budgets more as wish lists (the way we’d like to spend our money, in a perfect world) rather than reality-based guidelines (the way we need to spend our money to meet our financial goals). To create a budget that works and allows you live a comfortable and happy life, you need to get a firm handle on what you’re currently spending, what you can afford to spend, and what your priorities are. Whether you’re having trouble sticking to your budget or haven’t managed to create one, here’s an easy, step-by-step guide to help you create a budget you’ll be able to follow. If you like to track everything yourself to see exactly where your money is going, set up a spreadsheet in Excel and use formulas so that you don’t have to keep adding things up by hand. Make a point of collecting receipts and bills at the end of the day (or week) to update your numbers. If you prefer to monitor your spending without investing a ton of time, use a site like Mint.com, which allows you to connect your bank accounts and credit cards, so your daily transactions are automatically filtered into pre-set budget categories. You can see at a glance where your money’s going without having to track everything yourself. Whatever system you choose, make sure it’s one that feels user-friendly to you. The easier it is for you to maintain and monitor, the more likely you’ll be to stick to it. How much money is currently coming in? It is your net take-home pay after things like taxes and 401K deductions are subtracted. Include regular paychecks, side jobs, supplementary income, etc. How much money is going towards necessities? It includes utilities, rent or mortgage, car payments, medical costs, and groceries. To create a budget that won’t make you miserable—and one you’re most likely to follow—you need to allow yourself some “fun” money. How much depends on what your current financial situation looks like, as well as which things bring you the most joy. Maybe the most you can allow yourself right now is a cheap Redbox rental each weekend. Maybe you can set aside $50/week for a nice dinner. Decide which discretionary purchases are the most important to you and figure out how you can make room for them. You may not care at all about TV or clothing, for instance, but decide you do want to make room for theater and travel. Not all regular expenses are monthly expenses. Things like quarterly water bills and annual car registrations may not be on your monthly radar, but they are still predictable, so you should make room for them in your budget. To make sure you’re not socked with unexpected costs, create a slot in your monthly budget for these occasional expenses. Set aside a little each month so that when your quarterly or annual bill arrives, you’ll have the money available to pay for it. 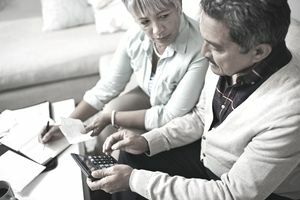 Decide how much you can reasonably afford to contribute to each goal, and if need be, tweak some of your variable and discretionary expenses to allow you to save even more. Saving is something too many people put on the back burner and then regret down the road. Be proactive and make a plan to save as part of your regular budget. Circumstances change. Our priorities shift, we change jobs, we move, we have children. Make an appointment with yourself every few months to sit down with your budget and make sure it’s working for your current goals and realities. If you’ve already got your numbers plugged into a program or website, it’s easy to play around with your budget categories to see where you can create extra room or prioritize one thing over another. Remember, your budget needs to work for you, not the other way around. What If Your Finances Are Solid, But You See Friends in Trouble?